Apples for Jam is Tessa Kiros's third cookbook, and like her first two, is a self-described "keepsake cookbook." As with all of her books, the photography is beautiful, and there is a collage aesthetic to the images and to the book's organization, making it almost like a scrapbook of images, recipes, and personal memories. Kiros's recipes are very ingredient based, with relatively simple preparations that highlight the natural flavors and textures of the food. That's part of what makes her books so perfect for summer cooking, when fresh foods need hardly any help from you in order to taste delicious. As a result, most of the ingredient lists in Apples for Jam are short, and the instructions succinct. This is unpretentious food, often creative but simple. In this book, Kiros arranges her recipe by color, and last night, I made her Penne with Tomato, Eggplant, and Ricotta from the "red" section. I can't think of anything more satisfying and comforting, in a light I-didn't-just-eat-my-weight-in-butter kind of way, than a simple pasta dish based on seasonal veggies. Cut the eggplant into similar, bite sized pieces, add a little salt, and drain in a colander for about thirty minutes. Heat some olive oil in a medium pan and sweat the crushed garlic until it becomes fragrant (at this point, I also added some red pepper flakes to give the sauce a little more of a kick). When you can smell the garlic, add the can of tomatoes, season with some S/P and bring to a boil. Once the sauce begins to bubble, reduce the heat and simmer 15-20 minutes. Better start that pasta water boiling about now! Rinse your eggplant, and dry it as you heat more olive oil in a larger pan, and sauté the eggplant on both sides until cooked through. 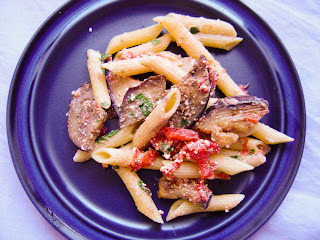 Depending on the size of your pan and the amount of eggplant, you may have to work in batches. I just transferred the first batch of eggplant to the sauce to keep it warm and to give it a little head-start in absorbing some of the tomato juices. Pasta should be cooking in the pot by now. Once the pasta is done, drain it, but keep a bit of the pasta water aside. Toss the pasta, eggplant and tomato sauce into a large serving bowl, add in the cheese, parsley, and some of the cooking water, and give it a good toss. That's it! For the side dish, I used a technique I picked up from Deborah Madison's book Greens to roast some small potatoes. Since I was serving two, I made two packets out of aluminum foil, into which went about 5 small potatoes (such as fingerling), a handful of cherry tomatoes and a few peeled whole cloves of garlic. After a drizzle of olive oil and a sprinkling of fresh thyme, I sealed the packets and threw them in a 350 oven for about 45 minutes, maybe a bit more. I love this preparation because each person gets their own little packet, and the garlic cloves are meltingly roasted and all ready to be spread on a few slices of crusty bread. For dessert, I simply sliced 4 stalks of rhubarb and a package of strawberries, tossed them in an ovenproof dish, added a bit of both white and brown sugar, a splash of orange blossom water and a few tiny cubes of butter for body. I put them in the oven with the potato packets and allowed the fruit to cook down while I prepared the pasta, and even through dinner. By the time we were ready for dessert, the fruit had cooked down into a kind of compote, giving off lovely thick juices with the aroma of orange blossom water. I ladled some fruit and syrup over a couple of bowls of ice cream and it was like eating pie alla mode without the crust. Delicious! Last night's dinner definitely centered around fresh ingredients, simply prepared. Perfect for a late summer night. Thanks for the recipe! Sounds like a perfect meal for August.